Columbia Yachts are dated back to 1960’s up till 1980’s. It would not be wrong to say they are one of the oldest, largest and most successful American sailboats when it comes to Fiberglass sailing yachts. We did custom mattress for this Columbia 38 sailboat. As the image shows, it is a very tight space and indeed an odd size but no worries, as they all are and that’s what we specialize in at Yachtbedding.com. Each boat mattress or topper we make is crafted to fit the unique size and shape of your berth. They are crafted custom in California and built to stand up to rigors of a marine environment. One of the biggest battles on a boat is fighting moisture due to climate fluctuations. For this client, we have used our moisture barrier under the mattress to help with moisture on the boat. Our mattress foundation is a 3/4″ spun polymer that is bonded to a breathable fabric. The foundation is cut to fit your mattress size and shape and keeps your mattress 3/4″ off the platform, allowing air to circulate. The foundation cannot be felt while lying on the mattress and it is maintenance free. An effective and cost-efficient way to keep your mattress dry and healthy. We can make any size and shape for your mattress but we specialize in Latex. The benefits of a latex mattress include being mold and mildew resistant, extremely comfortable, latex helps regulate body heat, which allows you to sleep cooler and it is bendable and breathable. The 7-Inch Commodore is by and far our most popular model. Constructed with a 6″ Latex core and covered in an ultra-soft bamboo quilting, this mattress is all about comfort. If you are a fan of a plush mattress then we definitely recommend to go with our 9-inch Admiral. We make it by starting with a super comfy 6” (medium) Latex core and then add 2” of ultra-soft latex Pillow Top and cover it in the plushest of bamboo quilting. The result is truly one super comfortable plush mattress. We also have an economical option to enjoy the comfort of latex and that is our Hybrid mattress. We start with a 3” base of hi density polyurethane foam and add 2 inches of soft latex and cover it in our plush bamboo quilting. It’s the perfect choice for guest bunks and crew quarters. With several boat mattress and mattress topper options to choose from, we are able to create a sleeping solution to fit all budgets. 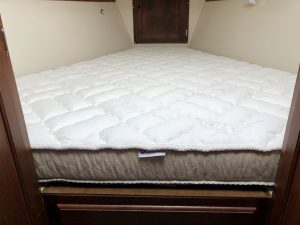 If you are thinking about freshen up your stateroom and hunting for a comfortable mattress option, then Yachtbedding.com can be your one stop for all your mattress and bedding needs for your boat. We have more than 1000 patterns on file so there is a very good chance we have the patterns for your boat. All you have to do is call us and our team will be happy to assist you in transforming your stateroom into a STATEMENT ROOM.